Explore a sci-fi world of robots and riches in NetEnt's new 20-line Wild-O-Tron 3000 video slot! The 5-reels and 3-rows of symbols are buzzing and beeping with anticipation of your next spin. Set in the 1960's inside a robot lab, try to connect the robot symbols and create a surge of winnings! 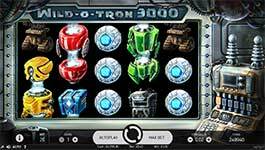 Explore a sci-fi world of robots and riches in NetEnt‘s new 20-line Wild-O-Tron 3000 video slot! The 5-reels and 3-rows of symbols are buzzing and beeping with anticipation of your next spin. Set in the 1960’s inside a robot lab, try to connect the robot symbols and create a surge of winnings! Wild Symbol – The Wild symbol substitutes for all symbols in the game. Wilds pay the highest possible winning combination on a bet line according to the paytable. Wild-O-Tron Feature – At the start of each spin in the main game there is a chance to activate the Wild-O-Tron feature. The Wild-O-Tron feature transforms all occurrences of 1 up to 6 robot symbols during the spin into Wild Symbols. During the Wild-O-Tron feature, the lamps on the Wild-O-Tron machine located beside the reels light up with the colours of the transformed symbols.